ship out FREE the next day! 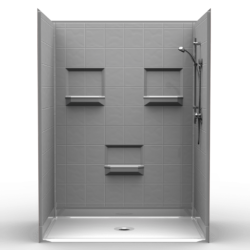 Today, we’d like to introduce two exciting 48 inch shower stall options from our popular Speed-It-Up shower range. If you’re not familiar with our Speed-It-Up program, you can read all about it here. 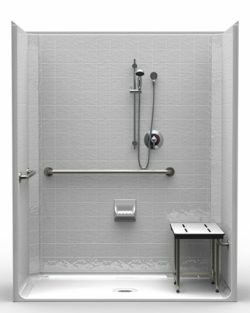 We’ve come to the rescue of many of our customers over the years and have made straightforward, speedy accessible bathroom installations possible … Continue reading "A Fully Installed 48 Inch Shower Stall Without the Wait"
One of the best things about installing an accessible bathroom in the home is that it can be perfectly tailored to the needs of the user. 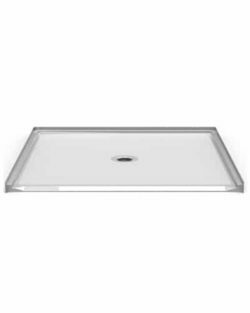 This means safe bathing accessories can be placed in the most convenient locations, everything can be fitted at the exact right height, and the overall design and appearance of … Continue reading "Designing Your Ideal Accessible Bathroom"
High quality shower with an easy install. Smart design with the full integral plywood backing in the walls. 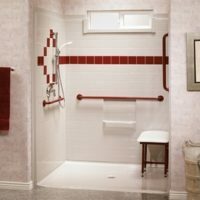 Makes for easy install of hand railing and other shower accessories. Wonderful shower unit .. so easy to install. Everything showed up on site as promised. My mother lives in a mobile home and this shower worked out perfectly for her. The drain location was very close to where her old tub drain was located. Best shower I have ever had! It is roomy, sturdy and bright. I'm glad I decided to go with the rain shower head as it is such a gently relaxing fall of water. The extras like the hand held shower head and the bench are very nice features with this product. The manufacture shipped it directly to us in Saskatchewan and we hired a carpenter/plumber to install it. They were very impressed with the quality of the shower. Thank you ORCA Health! I purchased this walk-in shower for my 86 year old Mom who could no longer get in her old cast iron bathtub. I was worried about the small bathroom we have but this shower fit in there perfectly and looks great. We're really happy with the quality of the shower and the installation. The finishing and trim all look really nice and the installers were great. And Joselle and Rey were really nice, helpful and pleasant to deal with. 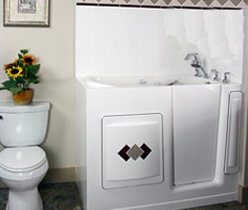 We are a Vancouver based family-owned business that enjoys helping seniors and people of all abilities transform their bathrooms into beautiful, comfortable and accessible bathing spaces for either private homes or commercial building applications – without compromising on décor. 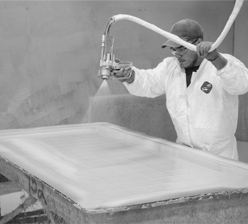 ORCA Barrier Free Shower Packages Shipped directly to your job site. 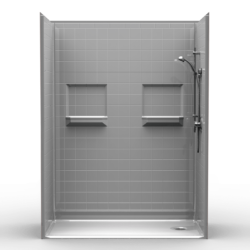 Keeping your Tub to Shower conversions on schedule and on budget ! ORCA HealthCare introduces the Authentic Height Adjustable Bathtub. Tub Cut Conversions making every day bathing just a little bit easier. - Learn more about it here ! Contractor Shower Size Cheat Sheet - Find your Shower Right Away ! 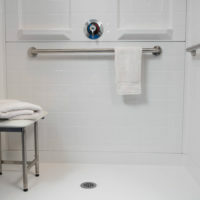 Check out our new website at www.orcahealthcare.com and find your specific shower size in seconds!! 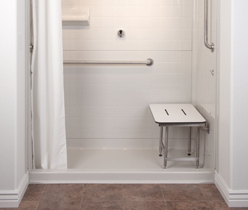 Huge selection of Handicap Shower, Walk in Bath, Walk in Shower, Roll-in Shower, Seniors Shower and Bathtubs with shipping to Canada and the US. Buy Today!